If you have searched for 'Biblical Baby Names' then "Congratulations" must be in order and our section on Pregnancy Stages might prove helpful. Whether you are the mother or father of a new baby, a member of the family or a close friend you are sharing in a major life event and taking a serious interest in choosing a special baby name from one of the many Biblical ones that are available. See below for our favourite Biblical baby names and we also provide the complete selection of over 2000 Biblical Baby name's to choose from! Still unsure? Then check out over 50,000 other ones available via the Index. 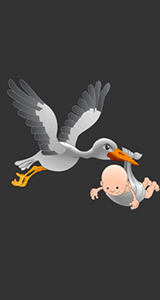 Click the following link if you are interested in the Biblical Symbolism of the Stork. The use of Biblical names explains the true sense of the term Christian name. The church used to encourage the use of Biblical name's and particularly those with Christian significance when naming babies. The bible was used as a principal source for naming babies. The biblical name was selected from the Old Testament, which were preferred by Protestants, and also from the New Testament. The name's of Saints were also a useful source of babynames and these were the ones that were preferred by Roman Catholics. The Hebrew names came from the Old Testament which were the source for naming which has been encouraged by the Protestants since the 16th century. Bible names also included those derived from Greek and Latin. The split between the Roman Catholic and Protestant religions led to serious conflict between to two groups. The Protestant faith led to the introduction of another extreme religious faction called the Puritans. The persecution of the Protestants and the Puritans led to their immigration to the New Land - the USA. This explains the dominance of Old Testament names in America. Some of these were obscure, such as Nebuchadnezzar, which have since diminished. But the use of Biblical names in the USA was quite significant. An example of this is illustrated in the famous MGM Musical, Seven Brides for Seven Brothers - In the story the brothers were all given a Biblical name. When it came to the letter 'F' there was a problem in finding a biblical name so in desperation the baby was given the name Frankincense (aka Frank)! If you have ever wondered about the type of name associated with virtuous characteristics, such as Chastity or Charity, these were favoured by the Puritans for the females in the family. This allowed them to move to even more pure ones than even the Biblical source. An understanding of Biblical names, why and how they were used can reveal a religious persuasion. This can be viewed as a great advantage creating an immediate sense of belonging or conversely a great disadvantage arousing an instant prejudice. A name is incredibly important and people will always be judged by their name. Once you are aware of any possible issues that might be associated with choosing a Biblical name then the Bible offers a fine array to choose from. Some of them are truly beautiful as you will see from the list below. We hope that we have provided you a balanced view of the pleasure and the pitfalls of choosing a Biblical Name. To assist you further we have developed a Name Evaluator - an essential aid when considering Biblical Baby Names. Detailed below is a selection of some of our favourite biblical baby names for both boys and girls. The range of Biblical names available allows for an unusually large source of boy and girl names. 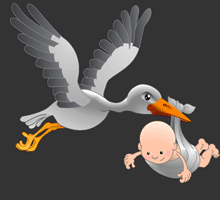 For a FULL list of nearly 2000 please click the following link Biblical Baby Names List. Click the following link for a comprehensive dictionary of Biblical Names and the Meanings.